The name says it all: 3D metal paintings and other artworks in an industrial style have a distinguished urban flavour that reminds you of the atmosphere in a workshop or a factory. With its origins in New York in the 1940s, the industrial style has spreaded all over the world today and found a sweet spot in loft-style living rooms or law firms with a large glass wall or storefront. These paintings, sculptures and metal paintings are distinguished from other styles by their roughness and minimalism. If you are interested in creating stark contrasts in your interior design, then you should combine art in industrial style with Shabby Chic decor – imagine the sparks of when romantic meets rustic! After all, you are the one who decides how consistently you should decorate a space in an industrial style. Amongst artworks in industrial style you can find countless filigree details and impressive combinations of different materials. Consequently harsh impressions are softened, creating a subtly edgy highlight in your dining room or office that coordinates well with other furniture or decorative items. If you have the luxury of space, then you should have a look through our new XXL oil paintings which never cease to impress with their monumental sizes. And if you simply cannot wait, then you can order an artwork from our preview section. 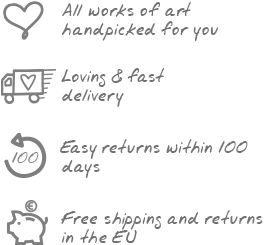 Pre-ordering from this category means acquiring a unique piece of work from a limited edition in advance as well as a considerable discount! Artworks in industrial style provide a unique atmosphere in your living room with their rough charm. Our 3D metal wall art brings workshop flair into your home and creates enthralling accents on your walls that cannot be overlooked.